My first contribution for 101 Sequencers project, named Police after inscription found in the box that became the encasing. The core parts of this sequencer were assembled during Modular Collective Instrument workshop (given by Kokomys in Mansedanse 2011 festival) as the master clock for the Instrument. The core has a simple 4060 binary counter with internal clock, with two outputs with 1/4 frequency ratio and a pot for frequency control. For 101 sequencers project, I expanded the sequencer to have four outputs and external clock signal input, selectable by switch. When the external clock is in use, 4060 performs frequency division, giving out 1/64, 1/256, 1/512 and 1/1024 of the input signal. This will be used to create longer sequences. With one hundred and one sequencers on the stage, we can afford very long sequences also. Since 4060 is a ripple counter, the circuit also contains an inversion stage, making the different outputs change state in a maybe more musical way. NAND gates are used for inversion instead of simple inverters simply because 4093 was on hand at the moment. It uses one inverter from cd4069 as a summing amplifier. 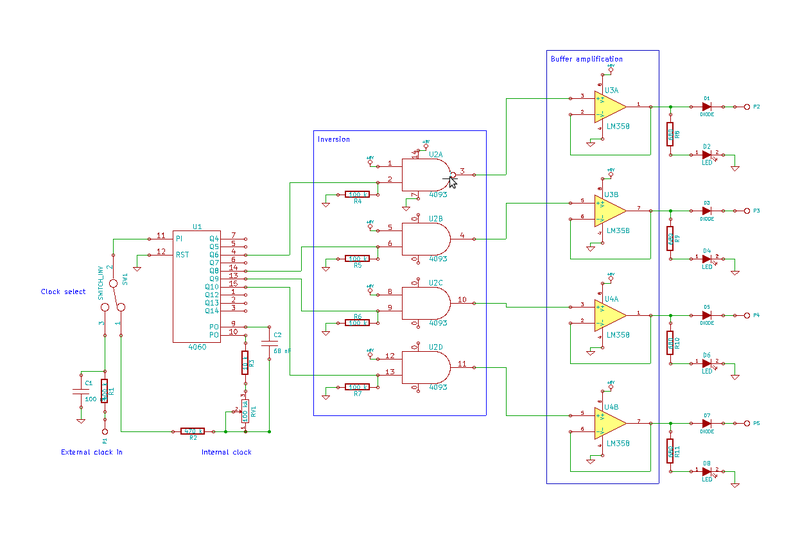 You can add more channels by repeating the input circuitry (100k pot, 0,1uF cap, 47k resistor) The 500k pot is gain and will give a nice amount of distortion if/when needed :) You can use a single 4069 chip to build both filters in the previous post and this mixer. 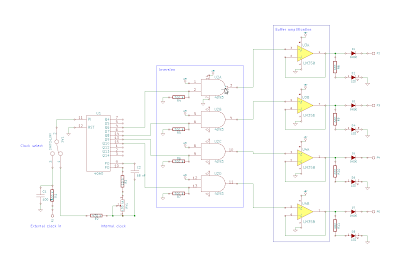 Here are two easy to build filter circuits based on the cd4069 chip. I´ve used them in my recent projects and I´m quite pleased how they work. These schematics are examples meant to be a starting point and the component values are examples so feel free to experiment with different values. It uses three inverters. So you can build two with a single 4069. R1 and R2 are the cutoff frequency use a 10k-20k stereo pot or two ldrs and leds driven with a cv source (lfo,sequencer etc.). Cap values are drawn 0,1uF but I´ve built one with 0,047uF and it worked fine. The 100k pot is resonance, and this filter will oscillate when resonance is turned up. There are two output options drawn in the schematic "out" (wich is more bassy) and "out2". You might want to use a output cap (1uF). Second one is a bandpass filter. This thing uses only one inverter. Try different cap values instead of 0,01uF ones(maybe from 0,001 to 0,068) and they dont all need to be the same. 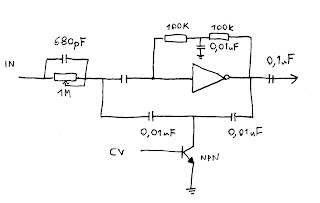 This is also voltage controlled with the npn-transistor you can use a pot to ground, ldr etc. insead if you like.